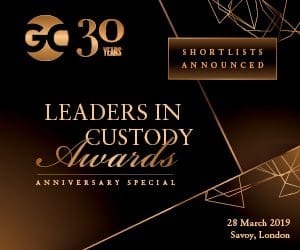 Global Custodian has published the shortlist for its upcoming Leaders in Custody awards for a special 30th anniversary evening at The Savoy in London. The awards will take place on 28 March and honour the very best in the securities services industry from the past year. The categories will consist of our coveted annual awards from our agent banks in major and emerging markets surveys, along with recognising innovation, network management teams and other areas of excellence through our editors’ choice honours. Global Custodian will also crown its annual Industry Person of the Year on the night, along with handing out a Lifetime Achievement award. As part of the 30th anniversary celebrations, there will also be continued excellence awards to those who have achieved survey success throughout the magazine’s rich history. Leading the way in nominations this year is BNP Paribas Securities Services with nine, while HSBC appear in four categories, and Deutsche Bank, Northern Trust and Nordea Bank in three. There are also 11 securities services firms with double nominations, including Mizuho Bank, Standard Chartered, Edelweiss, SEB, VTB Bank, SIX Securities Services, Societe Generale, Citi, Clearstream and Santander. Shortlists have not been made for individual awards and will be announced on the evening. Nominations for innovation and network management team awards are now also open and can be made by visiting our Leaders in Custody events page.